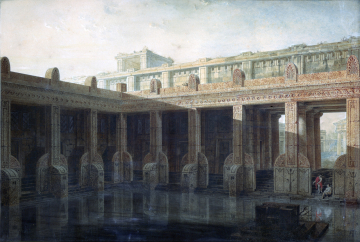 This watercolour was presented to the Museum as the work of John Soane junior (Sir John Soane's elder son) by one of his descendants and must be the watercolour that was exhibited under his name at the Royal Academy in 1811, No. 889 Perspective view of a design for Public Baths. It seems almost certain that John was assisted in its production by Joseph Michael Gandy as it bears no resemblance to other works (see XP8 and XP9) known to be in Soane junior's hand. The date that it was exhibited coincides with John junior's time as a pupil in Gandy's office in Liverpool and it is always possible that Gandy generously allowed the young John to exhibit a work under his own name that was in fact mostly (or wholly) the work of his master - perhaps out of respect for the young man's father. 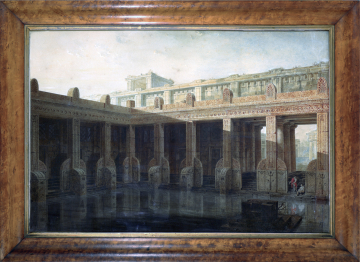 Given to the Museum by a descendant of Harriet Soane, daughter of John Soane junior.